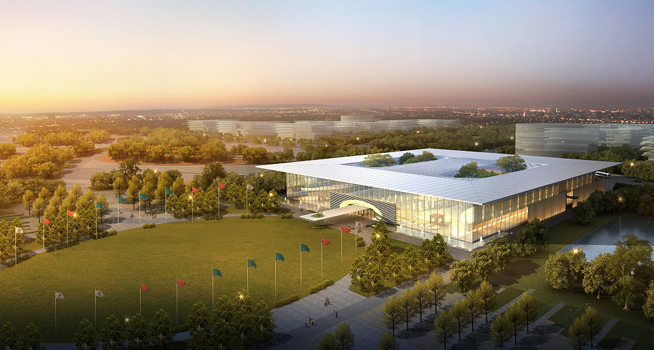 Since the inception of the National Cybersecurity Talent and Innovation Base (referred to as the Cybersecurity Base) in the Wuhan Linkong Economic and Technology Development Zone, it has been receiving a lot of attention and CCTV News Channel has referred it as a “national business card” to the world. The Cybersecurity Base meeting area is considered the service core in the first phase of the entire Cybersecurity Base. It covers an area of 270,000 square metres and the construction area is about 100,000 square metres. There are an “exhibition centre”, a “release centre” and a “commercial service centre” in the planned construction centre. The exhibition centre is located at Xinjing Road, Linkonggang Avenue, Dongxi Lake. It has a 500-million RMB investment and a construction area of 24,000 square metres. There are two floors on the ground and one underground, having three functional areas; conference service, display and reception. 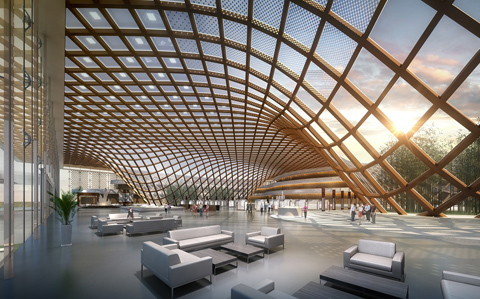 The building adopts the design concept of “do as one pleases without boundaries,” with the novel technology and environmentally friendly design symbolizing the freedom and security of the network. The exhibition centre is like a stretched net. More than 10,000 steel rails are connected into a curved and soft “net pocket.” This net pocket has a total of 2,785 double curved tempered fritted glass panels. All the glass panes are different, and each piece is a rhombic-shaped irregular quadrilateral. 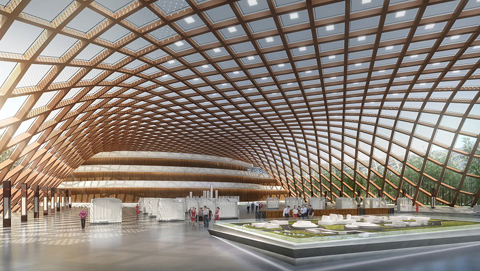 With the curved surface of the roof, the direction changes constantly. The processing ensures that the hyperbolic shape is smooth and excessive. The curved glass curtain wall of the exhibition centre forms an open and transparent structure, and the net can be seen from outside. The construction process was so difficult that the designers nearly couldn’t expect a second case in China for the designs such as natural lighting, roof photovoltaic power generation, rain water recovery, etc. 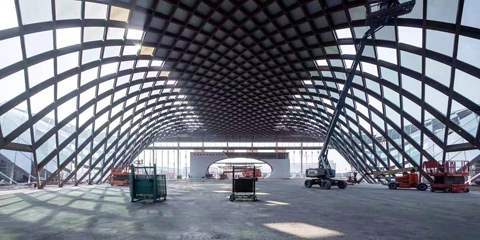 Shanghai Glass BU undertook the glass supply project. According to the progress of the project, the customer confirmed the order on September 18, 2018. 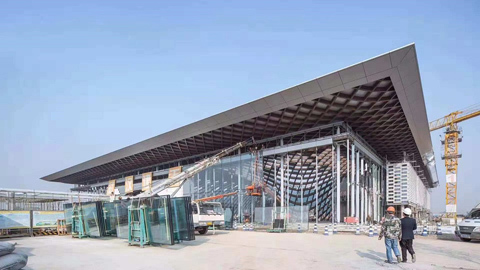 Shanghai Glass BU, a subsidiary of NorthGlass Group, spared no effort to arrange production and split the specific order to be align with the customer’s installation scheme, optimizing production management, and completing the installation with high quality in just 60 days. Shanghai Glass BU delivered such a satisfactory answer in such a short period, leaving a deep impression on the owners and the glass curtainwall company. This national business card created by the excellent processing of NorthGlass has been completed. As the first batch of key projects started by the National Cybersecurity Base, the exhibition center will become the world’s top display and exchange platform for achievements in the field of cybersecurity. It’s the important window of the cybersecurity base and a great landmark building in the city of the cybersecurity industry. For more information abut NorthGlass: www.northglass.global.